Beaver County Peace Links: Proto-Fascist Update: Why Are We Paying for War Crimes Training? Proto-Fascist Update: Why Are We Paying for War Crimes Training? That's how to solve the threat of militant Muslims? Our source had turned around after Shoebat's speech and asked the woman in the chair behind them at the conference what she though was the solution offered by Shoebat. "Kill them...including the children...you heard him," was the full response. Shoebat's Las Vegas speech was described by our source as "frightening." Bigoted trainers including Shoebat are highlighted in today's Washington Post article on "Monitoring America." Much of this information is new. Some of it was previously documented in a PRA Report, "Platform for Prejudice." Shoebat and the larger issue of how "Right-Wing Firms Train Public Servants on Terror Threats is the topic of a new report to be issued in January by Political Research Associates (where I work). OK, not credited for our work by the Washington Post and then partially scooped on this topic just as we are about to release our report. Sigh. That's real life. Back to Shoebat. George D. Little, Director of the Institute for Criminal Justice Studies (ICJS) at Texas State University, in San Marcos, TX, also attended the Shoebat speech at the Las Vegas training. When first contacted by e-mail after the ICTOA conference, Little responded "I believe there are good Muslims like there are bad ones just like there are good Christians and bad ones." Little, however, dodged repeated question about what he specifically thought of the content of Shoebat's speech, and now refuses to comment altogether. Shoebat is popular in Texas, having helped organize an anti-Islamic event near Fort Hood; spoken at an evangelical church; and conducted a statewide law enforcement training, "Preparing Law Enforcement Executives for the Future, co-sponsored by the state's Attorney General, Greg Abbott. Shoebat is also periodically interviewed as an expert on Islam on Fox News and is extensively quoted by the right-wing conspiracy website, World Net Daily. Another Las Vegas conference attendee, Edwin Uries praised Mr. Shoebat's ICTOA speech. "From my perspective, Mr. Shoebat's presentation was so much on the mark, so specific, and so correct that I was concerned that he would be the target of those about whom he spoke. Maybe the objections are merely a part of that," wrote Uries in an e-mail. Uries is an adjunct professor at Henley-Putnam University and a specialist in counterrorism. Watchdogs like Bartholomew and several Muslim and human rights groups have been complaining about this problem for some time. Last month I posted here on Shoebat and his allies, and included the next two paragraphs. Shoebat has said that "Islam is not the religion of God -- Islam is the devil." According to religion writer Richard Bartholomew, "Shoebat is a pseudo-expert on terrorism, Islamic extremism, and Biblical prophecy, and he teaches that Obama is a secret Muslim and that the Bible has prophesised a Muslim anti-Christ." This means for some apocalyptic Christians that Muslims then would be allies of Satan in the End Times battle between good and evil. This battle ends when Jesus returns and with a vengeful God kills all these deemed to be non-believers in Christianity. This bloody and bigoted version of apocalyptic prophesies is rejected and condemned by the Catholic and Orthodox churches and every major Protestant denomination. Abdus Sattar Ghazali wrote about Shoebat and other anti-Islamic bigots on the website of Muslim Military Members, an organization that serves as a network for Muslims serving in the US Armed Forces. 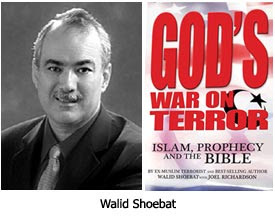 "Walid Shoebat has built a lucrative speaking career by manipulating the fears and whipping up hatred between Jews and Muslims," wrote Ghazali. Keith Davies, Director of the Walid Shoebat Foundation, disagrees. Davies claims that the Islamic "definition of Jihad quoted in Sharia law is clear and means struggle but is used in context of holy war to conquer infidels." This is the standard interpretation recognized by all schools of thought in Sunni and Shia Islam." [Not] every Muslim practices his religion to the letter but all that do are required to practice Jihad....So if say for argument 10% of Muslims actually practice their religion properly ( figure is probably much higher) that would be 150 million terrorists. Even if it were 1% that is 1.5 million terrorists. This interpretation of Islamic Law and its religious demands is an outlandish distortion; and yet it is being taught to our homeland security personnel. Davies, disagrees with me, and had a suggestion for me. Wrote Davies, "If you hate this country and its constitutional values of individual freedom and respect Islamic people so much, maybe Saudi Arabia could be a good place for you to live...."
What you hear from Walid is the TRUTH. The attendees were glued to what [Walid] had to say and the majority of them agreed. The liberal media is afraid to hear what the truth really is. Who has been planning attacks on our country? We are in a war of ideology and if you don't know that you need to get you head out of the sand. Before you make judgment see what is really going on then make an educated decision for yourself. Federal and state agencies have turned to right-wing "experts" on "subversion" throughout U.S. history. These experts have included informers who have surfaced to spin their tales in public; or converts who claim to have been involved in skullduggery and now are sounding the alarm. In both cases, the alarmist stories these self-dramatizing demagogues tell tend to be exaggerated or even invented. The fear that there is a conspiracy to undermine the government emerges periodically throughout our history as a nation. This hunt for an exaggerated subversive enemy "Other" is dubbed a "countersubversion" panic. One government official involved in deporting thousands of innocent Italians and Russians during the "Palmer Raids" panic in the 1920s described it as a "delirium." Most of us just call it a "Witch Hunt." Whatever we call it, this countersubversion tendency has fueled episodes of political repression by government agencies and right-wing "patriotic" groups. Shoebat may be the most outlandish example of the coterie of anti-Islamic bigots and fear mongers who are training law enforcement officials and anti-terrorism agents, but the problem is corrosive. Why are tax dollars being spent to peddle prejudice against Muslims in the United States? The Washington Post report will get much needed attention drawn to this matter. The upcoming report by Cincotta documents the problem in even greater detail. The solution will depend on a thorough and public review of this sad situation by government officials, elected representatives, a vigilant media, and public outrage.